Wet. Streambanks, roadsides, disturbed places. This is a 2″ to 48″ tall, erect, perennial forb that rises on usually a single stem from a compact, persistent rosette of basal leaves. It does not produce long, horizontal, underground stems (rhizomes) or underground winter buds (turions). The stem is erect and usually has many branches, near the base as well as near the top. It is often tinged with red. It has raised lines of fine, short hairs extending downward from the margins of the leaf stalks, at least near the top. Stem leaves are alternate but are so close together that they appear opposite near the bottom of the stem and often opposite or nearly opposite near the top. Lower leaves are on 1 ⁄32″ to ⅛″ long leaf stalks, upper leaves are stalkless. The leaf blades are narrowly lance-shaped to narrowly egg-shaped, 1¼″ to 4¾″ long, and ¼″ to 1⅜″ wide. They are rounded at the base and taper to a point at the tip with straight or slightly concave sides along the tip. The veins are conspicuous and are deeply sunken on the upper surface. The upper and lower surfaces are almost hairless except for straight, stiff, sharp, appressed hairs along the veins. The margins are toothed with 2 to 5 shallow, sharp, forward pointing teeth per ⅜″ of margin. The inflorescence is an erect, open, branched cluster of many flowers at the end of the stem and branches. The flowers are ⅛″ to ½″ wide. There are 4 white to light purple or pink petals. The petals are deeply notched at the tip, sometimes appearing as 4 pairs of petals. The stigma is not branched. The fruit is a long, hairy capsule containing numerous seeds. The capsule is 1½″ to 4″ long and is held erect on a 1 ⁄16″ to ⅝″ long stalk. Downy willow herb (Epilobium strictum) stem is unbranched or has just a few branches. Middle and upper stem leaves are evidently alternate. The leaves are narrower, no more than 5 ⁄16″ wide. The upper leaf surface is densely covered with straight, spreading or ascending hairs. The leaf margins are untoothed and are rolled backward (toward the underside). 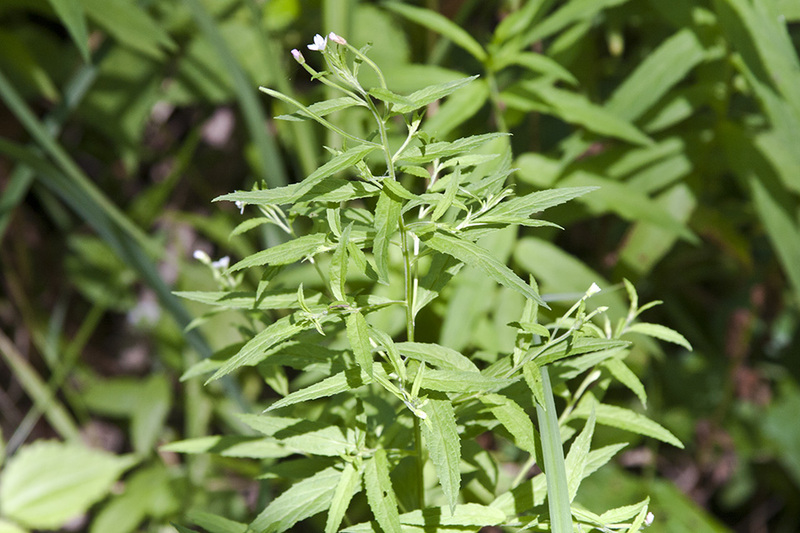 Narrow-leaved willow herb (Epilobium leptophyllum) has narrower leaves, no more than ¼″ wide. The leaf margins are untoothed and are rolled backward (toward the underside). The upper leaf surface is covered with straight, stiff, sharp, appressed hairs across the entire surface. Northern willow herb (Epilobium ciliatum ssp. glandulosum) rises from a large, fleshy, underground turion. It is usually unbranched or only sparsely branched near the top. The leaves are wider and egg-shaped or narrowly egg-shaped. The inflorescence is narrow, dense, leafy, and mostly unbranched. The flowers are larger, up to ⅜″ long, and darker, pink to rose-purple, rarely white. 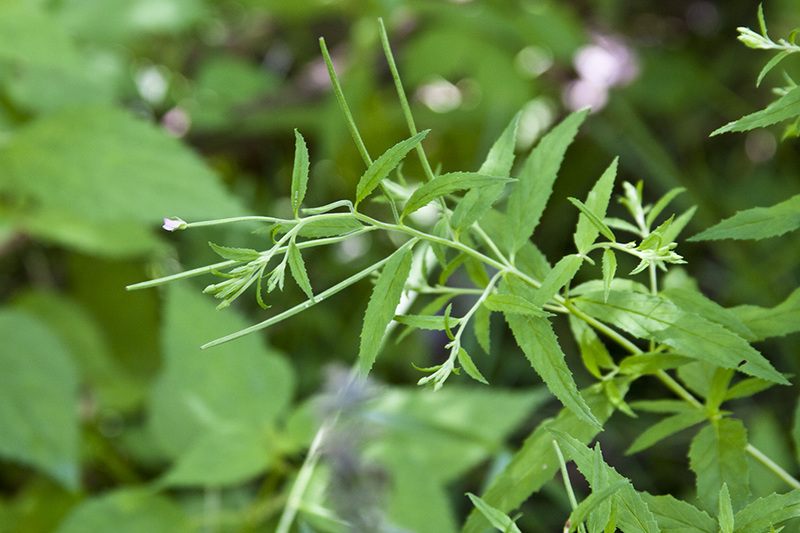 Purple-leaf willow herb (Epilobium coloratum) stems and leaves are often tinted purple. The leaves are often blotched with purple. The leaf margins are more densely toothed, with 4 to 8 teeth per ⅜″ of margin. The fruit is smaller, no more than 2″ long. Distribution Sources: 3, 7, 4, 5, 7, 28. A usually fleshy bud that overwinters and from which new growth emerges in the spring; winter bud.